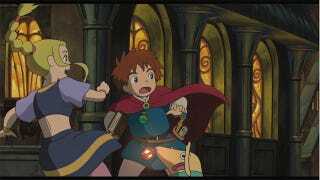 A whole bunch of people who pre-ordered Ni no Kuni are having all sorts of issues getting their copies of the PS3 role-playing game, which came out Tuesday. We've been getting tons of tips about the pre-order issues for the past two days, and people have taken to publisher Namco Bandai's forums to complain. People who pre-ordered the special Wizard's Edition of the game from Namco's store tell us their orders remain unshipped, and in some cases, cancelled entirely. There's even a big thread on the Namco forums titled "The (un)official 'What's going on with my order' thread." Check it out to see a big FAQ created by one of the Namco forum members, and plenty of angry complaints from people who have yet to receive the games they put down money for—or whose orders were cancelled with no explanation. I reached out to Namco Bandai this morning to ask about these pre-order woes, but I have yet to hear back. I'll keep you updated as I hear more.